The impulse to begin a review of the buzz-fueled Sundance sensation Escape from Tomorrow with the film’s production context feels, at this point, both de rigueur and utterly superfluous. More than its plot details or perceived quality, it’s the movie’s guerrilla shoot that anyone with a passing familiarity with Escape from Tomorrow will know about. Nevertheless, I will recount the saga, as one could scarcely make sense of why Randy Moore’s dystopian tale would otherwise be worth the ink spilled over it. In brief, Moore and his team filmed this tale of theme-park-induced emotional breakdown by actually sneaking in a bunch of clandestine cameras into both Walt Disney World and Disneyland and shooting most of the movie without permission from the parks. (Certain scenes were later filmed using green screens.) When the film premiered at this year’s Sundance Film Festival, critics and commentators speculated on whether it would ever see a conventional theatrical release, given the distinct possibility of legal injunction by Disney over its prominent, non-permitted use of copyrighted images. The conglomerate seemed poised to strike, only to back off after evidently realizing that a David and Goliath–type struggle might very well bolster the cultural prominence of a film whose low-budget aesthetic and oddball plot twists would probably relegate it to the art-house circuit anyway. (Such thinking was inevitably helped along when legal pundits opined that Moore’s work constituted a work of social commentary, and would therefore be harder to block on the grounds of copyright infringement.) Disney’s decision to call off its legal dogs helped Escape from Tomorrow secure distribution through John Sloss’s Producers Distribution Agency. The film’s back story—consistently made the focus of pre-release coverage—would presumably provide just the sort of DIY street cred and stick-it-to-the-mouse anti-corporate cool to intrigue audiences. It’s naïve to divorce one’s perception of Escape from Tomorrow as a cinematic object from the extratextual context within which it’s been situated. The film’s endless parade of Disney icons—Mickey Mouse merchandise, Buzz Lightyear rides—virtually precludes it anyway. Moore’s entire satirical claim rests upon the idea that, by infiltrating the belly of the beast, he can more completely cast its inner workings in strange new lights and reveal the bizarre, sinister qualities of images we would otherwise gaze upon with warm nostalgia (or, at worst, haughty indifference). So enamored is Escape from Tomorrow with the prospect of exploding Disney iconography from the inside, however, that it never bothers to figure out what exactly it intends to say and how it could be said in a provocative, intelligent, or cogent manner. As a result, the film flails from one would-be uncanny set-piece to the next, grasping for Lynchian surrealism but ending up mired in an ever-growing pile of narrative dead-ends, short-circuited cultural commentary, and dubiously “self-aware” misogyny. 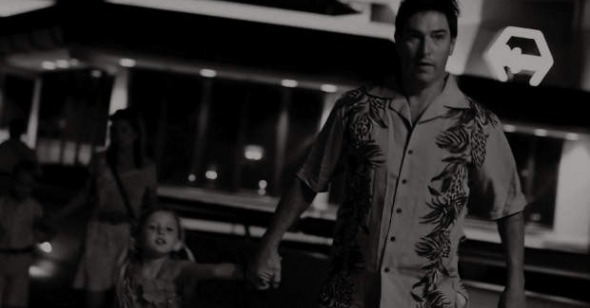 The tonal problems come early, as Escape from Tomorrow cannot seem to decide whether it wants to satirize its protagonist’s midlife-crisis buffoonery or position his erratic behavior as somehow symptomatic of an amorphous psychic malaise within the park itself. Jim (Roy Abramsohn), a middle-aged husband and father of two, has just been fired from his job over the telephone as he stands on the balcony of a Disney resort hotel room. Returning to wife Emily (Elena Schuber) and children Sara (Katelynn Rodriguez) and Elliot (Jack Dalton), Jim chooses not to reveal his now-unemployed status to his family, so that they can enjoy one last day in Disney World worry-free. Soon after entering the park, however, Jim spies a pair of sloe-eyed French teenagers (Danielle Safady and Annet Mahendru), who, with their carefree laughter and attraction to phallic symbols (chomping bananas, clutching tram polls), promise a tantalizing alternative to the harping demands of his family. His increasingly blatant pursuit of the young women becomes interlaced with other, inexplicable visions and encounters: demonic faces appearing on the dolls within the “It’s a Small World” ride; a whirlwind fling with a leering fellow parent (Alison Lees-Taylor); the threat of an ill-defined ailment known as cat flu. These and other vague signifiers bob in and out of Escape from Tomorrow’s narrative, jostling for prominence with an endless cycle of men-are-slobs/women-are-shrews jokes. At first, the hyperbolic nature of these riffs on gender difference seems to pitch the humor on the knife-edge between pandering and self-conscious satire. Besides the French girls’ aforementioned love of all things dong-like, Moore continually finds phallic imagery within the park itself. These visual puns aren’t exactly original (columns of water erupting from fountains, etc), but at least Moore is connecting the sexual frustrations of his protagonist with the stylized showmanship and smiley-faced insipidity of the park itself. Once such fusion of character and place evaporates, Escape from Tomorrow loses what little wit it initially mustered, becoming merely a recycling of harpy-wife eye-rolling and dumb-dad bumbling to increasingly airless and offensive effect. Such a move not only tries viewer patience, flattening what little intrigue Jim had as a character, but places the burden upon the film’s bizarro narrative elements to pick up the slack. If we feel little attachment to our hero, we at least need to feel that the haunted house he lumbers through offers enough unsettling pleasures to justify journeying alongside him. Moore cannot commit to a body of images and ideas with which to create his shadowy underworld within the Magic Kingdom. Escape from Tomorrow keeps tossing ideas against the wall (Disney princesses as prostitutes! Mad scientists underneath Spaceship Earth! Lurid recreations of Disney movies featuring little children! ), which strain for menacing subversion yet lack the coherence to achieve the all-encompassing nightmare logic of a true cinematic freak-out. The film is not without its moments of visual punch—a low-angle shot of the French girls clasping hands with two teenage boys as they gaze at the Epcot fireworks has an eerie grandeur—but ominously-lit black-and-white close-ups of “innocent” childhood icons do not a neo-Eraserhead make. The end result feels at once muddled and thuddingly obvious. Is there anything really that mind-blowing about the claim that the Disney empire is (wait for it) anything but fairy-tale innocent? Reappropriations of the company’s images have provided fodder for artists of all conceptual stripes and mediums for decades, most notably such winking postmodern court-jesters as Paul McCarthy (in his recent WS) and Banksy. Whatever one thinks of, say, the English-based graffiti artist (whose much-publicized return to New York is coincidentally occurring as Escape from Tomorrow hits theaters), his reworkings of Disney iconography have an open-ended defiance and pungent wit that speaks to an ambiguous but undeniable intentionality. Moore seems to have little to say about the place of the omnipresent corporation in contemporary life except that, well, there’s something kinda off about the whole thing, you know? And by filtering these amorphous concepts through the sputtering frustrations of a middle-aged sad sack, Escape from Tomorrow inadvertently shores up the sort of time-frayed clichés about male sexual and social anxieties that Moore seems to think he’s satirizing. It makes one appreciate all the more why the film’s covert production techniques have been placed center stage. Moore and company’s bomb-the-system ingenuity in filming Escape from Tomorrow is gutsy, freewheeling, and provocative. If only some of those qualities made it into the finished product.